WTI prices are attempting to climb back to $53/b this morning. 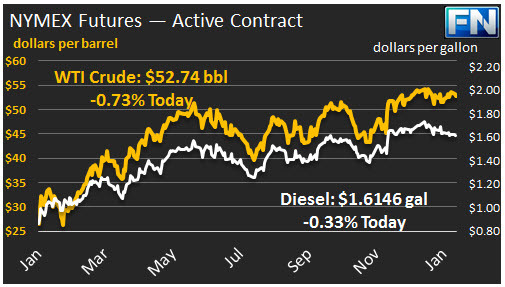 Crude and product prices slumped yesterday, bringing WTI crude prices below $52.50/b. WTI opened at $52.60/b today, a drop of $0.55 from yesterday’s opening price. 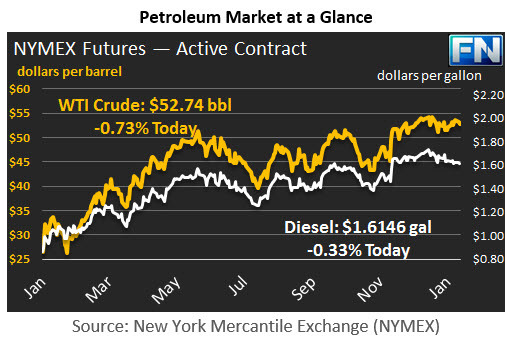 Current prices are $52.74/b, $0.11 above yesterday’s close. Political turmoil has increased with the fallout from the latest executive order from President Trump, setting barriers to U.S. entry for people from seven predominantly Muslim countries. The legality of this order was instantly questioned, and the new president fired the acting Attorney-General for refusing to enforce it. The unpredictability of U.S. policy is causing market volatility. The Dow Jones Industrial Average, which had reached a giddy high of 20,125.58 on Thursday, dropped to a close of 19,971.13 yesterday. The MSCI Asia Pacific Index and Japan’s Topix index also dropped. Distillate opened at $1.605/gallon in today’s session. This was 1.39 cents below yesterday’s opening price. Current prices are $1.6146/gallon, up 0.79 cents from yesterday’s close. RBOB opened at $1.5041/gallon today, a significant drop of 1.81 cents from yesterday’s opening. Prices are $1.5252/gallon currently, a recovery of 1.97 cents from yesterday’s close. The EIA released its data on U.S. Retail Gasoline and Diesel Prices for the week ended January 30th. Prices for both fuels declined at the national level. Details are presented in our second article today.